I was just wondering whether the "classic" mental illnesses can be diagnosed from the palm? I am referring to the classically identified schizophrenia, clinical depression, and bipolar disorder. Some people might object to the use of these labels, but these disorders have been identified across cultures and peoples, and can therefore be considered a universal or ubiquitous part of the human condition. Perhaps it is not appropriate to relate wholesale disorders to the palm. Maybe it is more a question of identifying symptoms: hallucinations, delusions, depression, mania, etc. Or maybe it is more a question of identifying predispositions rather than actual manifestations. I posted this question on the Yahoo forum about two weeks ago (before I found out about this forum) but got frustratingly obtuse answers. This topic has been discussed in the works of Charlotte Wolff, Yael Haft-Pomrock & Arnold Holtzman. These authors have described some of the typical hand features that can be featured with the various disorders that you've mentioned. Often there appears to be a mix involved of inherited & developed hand characteristics. And of course there are hormonal issues involved as well. But in general, I think one should really be aware of HOW these psychiatric disorders usually develop before one can start studying this topic. Martijn, thanks so much for the recommendations! I have just ordered two books by Haft-Pomrock. Wolff's book seems a little more difficult to find for sale. I must admit I find the area of psychological diagnosis through the palm to be very fascinating. So if I am understanding you correctly, there are no clearly distinguishing features for schizophrenia in the hand, but rather more subtle clues. I find that surprising, since it is such an extremely psychologically debilitating illness, at least for one's functioning. And one would have thought that clinical depression would be more explicitly indicated in the hand as well. cshahar wrote: Martijn, thanks so much for the recommendations! I have just ordered two books by Haft-Pomrock. Wolff's book seems a little more difficult to find for sale. I must admit I find the area of psychological diagnosis through the palm to be very fascinating. The fundamental problem with schizophrenia is that it is a very complex disorder. As you probably know, it has hardly any unique characteristics which are never seen in other mental disorders. And of course, there are the various subtypes! It has been suggested that schizophrenia can be described as a condition of complex inheritance, with many different potential genes involved - each of small effect, with different pathways for different individuals. So, in the perspective of the complex etiology (multiple causes) ... I think it is not surprizing at all that schizophrenia is not featured with very clear distinguishing features in the hand (though I think in most people who have schizophrenia you will find multiple of the characteristics that I described on my website). 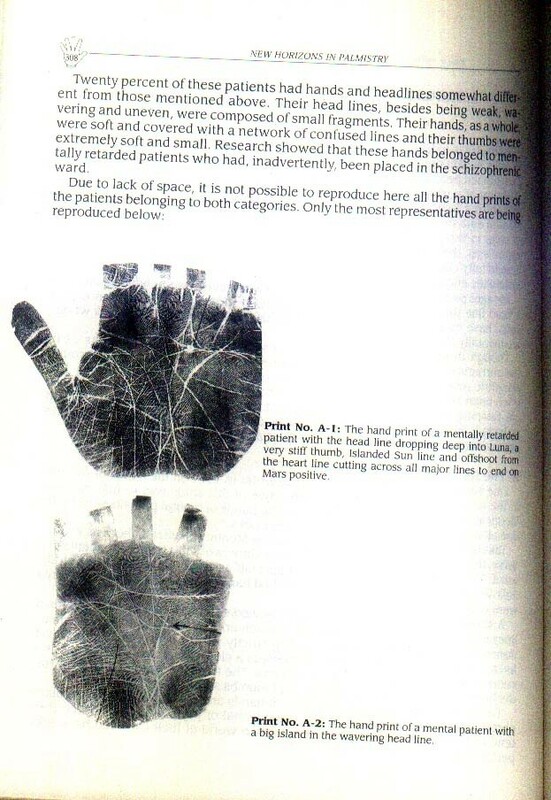 I also would like to add that while the work of Bagga is focussed on the dermatoglyphics (excluding the hand lines), the work of Haft-Pomrock & Wolff is much more focussed on the hand lines & morphology (including: postures, finger length). 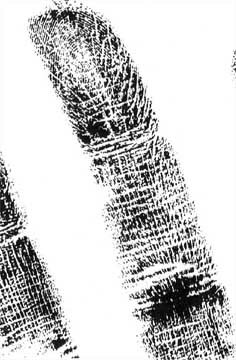 Fingerprint of a schizophrenic patient. Thanks for the insights Martijn! That seems highly significant when you consider that correlations between typical personality tests consider .4 or .5 to be significant (explaining 16-25% as common variance). I am so looking forward to taking more part in this discussion when I have more time, as it is an area of special interest for me. Hi Lynn. Scary, but perhaps not surprising, since their modus operandi is to deceive and manipulate. Is it possible that concealment and subterfuge extends to their hands as well? I seem to remember Benham referring to the sociopath at one point. Will have to research it more. Hi Charles. I'll try to find my notes. In the perspective of the forum section where this discussion was started (PsychoDiagnostic Chirology), I would like to add that PDC does not include the diagnosis of 'mental illness'. "PDC deals only with neurotic conditions. I would tell my pupils, from the start, to leave the diagnosis and modes of intervention in instances of pathological circumstances to competent medical people." So, this explains why the major psychiatric disorders (such as 'schizophrenia', 'anorexia', 'bipolar disorder' and other mood disorders) are not included in his work. Now I want everyone to listen very carefully with what I'm going to say, and I'm going to share my unfortunate experience with the previous P.I. Forum. Even if you have the knowledge, experience and the qualification to diagnose someone with depression, which I will use depression for this discussion, you do not have the right to do so unless you have the necessary knowledge about the personality/psychiatric/mental disorder. I have diagnosed several individuals with depression, not clinical or psychiatric depression, and every time I have been right. I have diagnosed myself with depression and several days later I was with a psychologist who diagnosed me as well. No where in any of my textbooks when I studied for my qualification was depression discussed and in any of my other books I have bought throughout the years is diagnosed dealt with, except the Psychodiagnostic Chirology textbook by Dr. A. Holtzman Ph.D., which I have not dealt with regarding depression. How I know about depression, is firstly, because from personal experience from diagnosing and it was right, but most importantly, when I was studying at the time, my mentor Chr. Kevin Leak B.A. Hons., was, and more than likely still, doing research on depression from the hundreds of his patients and from working at various institutions which deal with individuals with mental disorders and depression. This is the basis of my knowledge. Now, how can depression be identified? On the previous forum I uploaded a photo of the Air line (Head line in palmistry) and I was slandered by individuals who know nothing about 5 Element Chirology and nothing about Psychodiagnostic Chirology telling me that my 'theory' is ridiculous and no basis for it and that depression is a phenomenon. They had no right to tell me that since Kevin Leak has for years been studying depression that can be diagnosed in the hands and the fact is (back then) I have studied 2 years of clinical psychology including depression. In Psychodiagnostic Chirology, you are able to diagnose someone with personality disorders and hidden syndromes, as said in the index of the textbook. What Holtzman does is provides an etiology with each disorder and syndrome where every other fails to do so. So if you are going to diagnose someone with schizophrenia, you need to be prepared to explain to the individual what it is. What I'm trying to say is. Have the knowledge (theory and practice) of a disorder/illness before you have the right to diagnose, whether you do it on yourself or on someone else. And yes, I agree. Earlier in this discussion I already tried to mention (see my quote above) that it is indeed important to have some advanced knowledge about the 'mental illness' involved.... before one tries to apply related info to other individuals. In general it can be very usefull to listen to experience-experts. Though one should also be aware of the fact that... usually it takes a long way (of many years) before a 'patient' may become an established 'experience-expert'. Ron, thank you for your advice. Hi Martijn (and anyone else interested). I have just finished reading Charlotte Wolff’s “The Hand in Psychological Diagnosis”. It was an interesting read. First, many of the terms she uses were interesting, albeit slightly confusing. Some, like paraphrenia, are no longer in circulation, although this condition corresponds most closely to a paranoid personality disorder (a milder, but non-psychotic version of paranoid schizophrenia). Also, some of her terms would not be considered politically correct. For instance, she describes the intellectually impaired as “mental defectives”. So you were right Martijn. To ask whether schizophrenia can be diagnosed using the palm is a bit of a non-starter. There are different forms of schizophrenia, and according to Wolff, different markers associated with each condition. There were two basic methodological limitations associated with her research. First, tests of significance were not included, to test whether the strength of the associations were beyond what would be expected by chance. Second, the control group was somewhat small. She also had an annoying habit of not including control numbers in every table, and sometimes she included only frequencies, and I had to calculate percentages myself. 1. Some of the features found in the palms of schizophrenics or manic depressives are also found in the hands of people who would be considered in the “normal” range of mental functioning. 2.The prominent features found in the palms of mentally ill people, are not found in the palms of all mentally ill people, or even in the majority of such people. 3. Most of the particular features found in the palms of mentally ill people are found prominently across more than one category of mental illness. 4. Some of the features described by Wolff (such as faults in the upper transverse or heart line) are too vague to have diagnostic validity, although they can be used in a generalized way. The etiology of the condition complicates matters. 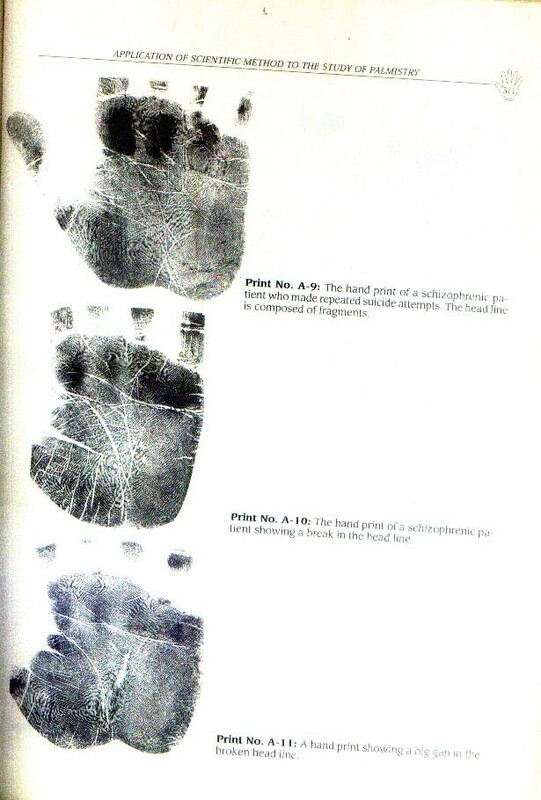 Congenital problems seem to have a much more dramatic influence on the shape and markings of the hand. An acute schizophrenic condition, triggered by a harsh environment / dysfunctional parenting may have an entirely different manifestation in the palm. To complicate matters further, Wolff implies that endocrinological conditions are associated with all types of mental illnesses and imbalances, and are the key factors in understanding how the palm relates to such disorders. So what can we conclude? If certain abnormal features are present in the hand we can conclude that a person LIKELY has some mental or emotional disturbances. And in fact Wolff says just that. But to declare what type of disturbances with any degree of confidence is a tricky proposition at best. So this naturally leads to the question of what use is palmistry in "diagnosing" personality traits and dispositions? If the four points I describe above also apply to character analysis through the palm, are the limitations to severe to be considered useful? Please note my contributions are simply observations from sitters as I have no formal training in this field. On schizophrenia- A friend - a Solomon Islander who has severe episodes requiring high security when active- has a very short head line barely or not quite reaching the middle finger- and four huge - in lay terms- mystic crosses. He was from a family of witch doctors on his island home in the Solomon's and had been in the Australian army then dismissed after developing psychological problems after serving in Timor. The acute phase started after working for a security firm who also was involved in drug running and smoking cannabis. I have noticed composite loops and whorls on the mount of lunar often are associated with mental health problems. I never would even contemplate 'diagnosing' any condition but after hundreds of hands do note certain line configurations can help with forming questions you may ask as to the real reason the person is sitting- often it can be a last call for help. In fact, people have thanked me and made big life changes after discussing things they need to work with in their hands. I also found the talk I gave about Charlotte Wolff's "The Hand in Psychological Diagnosis - Chapter 6, the Hand of the Mental Defective". As you say, some of her terminology is not politically correct these days but were the actual medical terms in her day eg "cretin, idiots, feeble-minded" etc. re your comment about endocrinological conditions - Wolff says that Downs syndrome is endocrine in origin, but now we know it is due to an extra chromosome. I haven't read all of this thread yet but one thing that tends to alert me is when I see something in a hand that appears to be in conflict with something else that would be unexpected such as........... a very delicate hand with earth width lines or appearing very empty or a strong hand with excessive watery lines. cshahar wrote: Hi Martijn (and anyone else interested). Thank you for your excellent review of Charlotte Wolff's research. I understand all points that you've made - and I can confirm far most of your points (though one should notice that Wolff's innovative studies were performed 60 years ago... so, how surprizing is it that some of her comments regarding the etiology & vocabulary related to schizophrenia are outdated?). Basically, I have spotted only one problem in your 'answer' ... specified to your very first conclusion (which I have quoted above). For, the first aspect of your conclusions suggests... that you expected (or hoped) that Wolff had found very UNIQUE CHARACTERISTICS in the hands of schizophrenics - which are never found in the hands of other ('normal') people. However, Charles, using such a criterium... is not even applicable to the typical hand characteristics in Down's syndrome!! While it is a 100% fact that it is actually quite easy to recognize Down's syndrome from a pair of hands - but for sure... one really has to focuss on COMBINATIONS of hand characteristics. My major 'disappointment' regarding her work is exactly this point: in her studies Wolff has not focussed at all on studying the occurence of specific combinations... which should really the basis of any diagnostic procedure based on the hands. Wolff's studies revealed that a 'too long fifth finger' has been found in about 44% of the studied schizophrenics (109 out of 245 patients). While in all other populations this percentage for the occurence of a 'too long fifth finger' was much lower: below 22% (epileptics: 21%, paraphrenics: 17%, manic-depressive: 9%), and in normal people in between (chidren: 12%). Wolff's studies revealed that a 'simian' has been found in about 15% of the studied schizophrenics (37 out of 245 patients). While in most other populations this percentage for the occurence of a 'simian line' was much lower (epileptics: 15%, paraphrenics: 11%, manic-depressive: 5%), and in normal people in between (chidren: 5%). 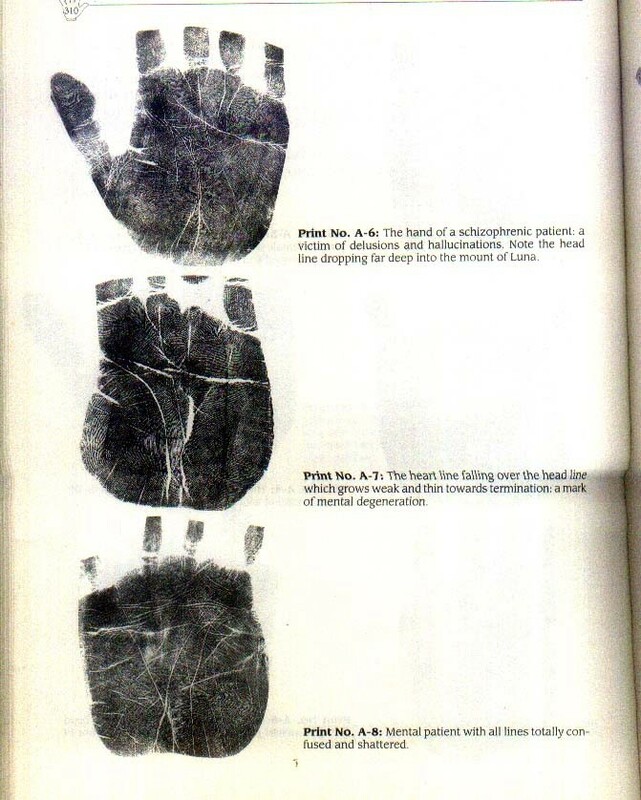 Now... could the combination of a 'too long 5th finger' + a 'simian line' be a SIGNIFICANT MARKER for schizophrenia??? The answer might be 'yes' (both for males and females) ...but Wolff didn't study this specific question! A few other considerations about Charlotte Wolff's work, especially thinking about background conditions at the time she did her studies. (NB I have read more about her mental handicap studies than mental illness). Please forgive outdated terminology some of which these days can be considered offensive - no offense intended, I am quoting terms officially used at the time. Although I think Charlotte Wolff was way ahead of her time, we have to remember that her research was done 60-70 years ago. She did some research at St Lawrence's Hospital in Caterham, which was set up in 1870 to care for people with mental illness and people with mental handicap. These people mainly came from the London workhouses "insane paupers". Some children - who were 'difficult', from poor families, or even just illegitimate, were placed in such institutions. Wolff was aware that many people in such hospitals were misdiagnosed and misclassified - indeed this was still the case when my husband worked at St Lawrence's 40 years later. For example, intelligent people who had cerebral palsy or deafness, were placed in wards with severely mentally handicapped people, because of communication difficulties or other problems which made them appear less intelligent than they really were. St Lawrence's most famous patient was Joey Deacon who had cerebral palsy, admitted to the hospital at age 8 after his mother died, it wasn't until 40 years later that another patient managed to understand that Joey could communicate. Joey was actually intelligent and all those years had been trying to communicate, but because people only heard 'incoherent noises' he was deemed to be 'of subnormal intelligence'. Joey would have been at the hospital during the time of Wolff's studies, and indeed others like him. So, some of the people she studied would not necessarily be accurately placed within the various classifications of "feeble minded, low-grade imbeciles, idiots" etc. Even if these children were within normal range of mental IQ and mental health at time of being admitted to the hospital, it is not surprising if some developed mental illness or learning difficulties through conditions of living at the hospital. Various syndromes that we are aware of now, were not diagnosed in Wolff's day, eg autistic spectrum disorder. She says that Down's syndrome is endocrine origin, but we now know it is a chromosome disorder (trisomy 21). So of course she was limited by the knowledge of the time. She says that concave primary nails are significant in the hands of "mental defectives" - ie. short broad nails with (no lunula) and a spoon-shaped concavity. This is also found in syphilis which in her day was frequently a hereditary/congenital cause of mental handicap & epilepsy. Concave nails can be a sign of malnutrition, especially iron-deficiency anaemia. The hospital diets were very poor, not balanced. It would be interesting to see if concave primary nails are still significant in today's people with learning difficulties, given improved diets and decreased incidence of maternal syphilis. Flexibility of fingers - Wolff comments that the high % of stiff hands in younger patients may be explained by "an unusual state of nervous tension conditioned by superimposed psychosis" (she recognises that some of the mentally handicapped may have also had a mental illness, a fact which has often been ignored until even recently). However, I think there could have been other factors - perhaps the institutionalisation, but more relevant maybe the crude drugs that were used at the time, probably some type of barbiturate. These drugs were still quite experimental at the time. eg It is now known that some of the drugs they used to treat mental illness can cause Parkinson disease type side-effects which makes the hands stiffer. There is nothing that records whether any physical handicap was taken into account eg cerebral palsy causes spasm & rigidity, the characteristic spasticity of the fingers. Some of Wolff's control (and studied) figures seem rather surprising. eg arched fingerprints in control goup - 20%. Seems high, I thought average distribution of arches was more like 8%? In some tables she doesn't give control frequencies. defects & islands in upper transverse crease seem low figures, both in controls (none had 'other defects', only 20% had islands) & studied patients (30% had islands), given that around 50% (sorry I didn't note where I got that figure from) of mentally handicapped people have some emotional difficulties and that long-stay hospitals produce emotional problems in patients. Wolff doesn't mention how many of the people studied had Down's syndrome. I'm not sure whether her definition of Simian line is the same as ours? In "The Human Hand" she says it is "when the lower transverse crease traverses the whole palm horizontally from outer to inner edge". But doesn't mention whether upper transverse crease is present - could she be describing a sydney line? Elsewhere she says Simian line is when lower transverse crease is missing or reduced to a a subsidiary branch. - I know I have spoken mainly about Wolff's work on people with learning difficulties, and the thread is about "Can mental Illness be diagnosed from the hand". Although I love Charlotte Wolff's work, given the constraints on knowledge at the time, and the situations of the people that she studied, I don't think we can decide from her work whether it is possible to diagnose mental illness from the hand. It would be good to see these studies repeated in modern times. (edited several times due to typos & omissions). Lynn wrote: ... - I know I have spoken mainly about Wolff's work on people with learning difficulties, and the thread is about "Can mental Illness be diagnosed from the hand". Although I love Charlotte Wolff's work, given the constraints on knowledge at the time, and the situations of the people that she studied, I don't think we can decide from her work whether it is possible to diagnose mental illness from the hand. It would be good to see these studies repeated in modern times. Thank you for your efforts - I think you've managed to describe very well how her studies should be seen in the perspective of time. And that was even long ago before the 70's when most experts thought that 'autism' was caused by bad mothers, etc. ...I remember about 15 years ago, that I heard about the idea that some experts even believe that 'schizophrenia' might include some other (genetic) diseases that have not been described/discovered yet. Such a process has already evolved regarding 'autism' - where over the years quite a few different labels became available to discriminate autism from 'fragile-X syndrome', 'Asperger's syndrome', etc. While in Wolff's days autism had already been discriminated from schizophrenia - some behavioral aspects can 'look' the same in the eyes of laymen (while obviously both disorders have a completely different etiology, etc). So, we should also realize that Charles... really choose to focuss at once on THE most complex psychiatric disorder of all (well-known) disorders. Edit: Fact is, that in schizophrenia there are not many 'always present' characteristics - if there are any: see the picture below. So, regarding the hypothesis of 'diagnosis of schizophrenia via the hand' we should try to avoid unrealistic expectations... nor 'hunt' for results that meet high requirements. Sorry about responding to everyone in one post. But thank you so much for your insights. They were very helpful. Felicity, I found your description of the Solomon Islander and his mystic crosses and short head line quite interesting. It brought to mind the thought that mysticism and mental illness may be far closer to one another than one might suspect. Both might involve similar chemical processes in the brain. And one might say that the ancient mystics and prophets often exhibited behaviors that could have been interpreted as “deranged”. In fact, there are cases of people who dabble in mysticism (such as the Kabbalah) and who lapse into a mental meltdown because they are not able to handle where such knowledge takes them. Lynn, I would love to know what Talma’s findings were. 1998 was a long time ago, but of course, I respect the issue of confidentiality. I couldn’t find anything related to her on the internet. Perhaps she never published, or more likely, it never made its way to the Internet. Sucom, that is an interesting point. I will keep my eyes open for such “conflicted” signs and their meanings. Martijn: As usual, you offer the wisdom of experience. Yes, of course, finding a combination of signs, rather than focusing on their isolation, would have enhanced the validity and reliability of her findings. There are so many statistical tests that can be done to identify clusters of patterns. But of course, we would need the raw data to reach any such conclusions. It is interesting that more research has not been done on this topic. I wonder whether the bureaucratic nature of current institutions would make it more difficult to conduct such research. Lynn, what you say is right on. The diagnosis of mental illness in those days was often arbitrary or misguided. Diagnosticians often saw what they wanted to see. Was it Rosenhan’s study I think in the mid-1970’s that revealed just how biased psychiatric evaluations really were? And I am sure there are still many abuses. Indeed, there are so many other intervening factors involved (lack of stimulation in institutional life, poor diet, the fact that some individuals experience multiple disorders, etc. etc.). It is all quite difficult to tease out. One would have to control for numerous factors to really begin to see how the palm can reveal what is going on.Thank you for many great observations. 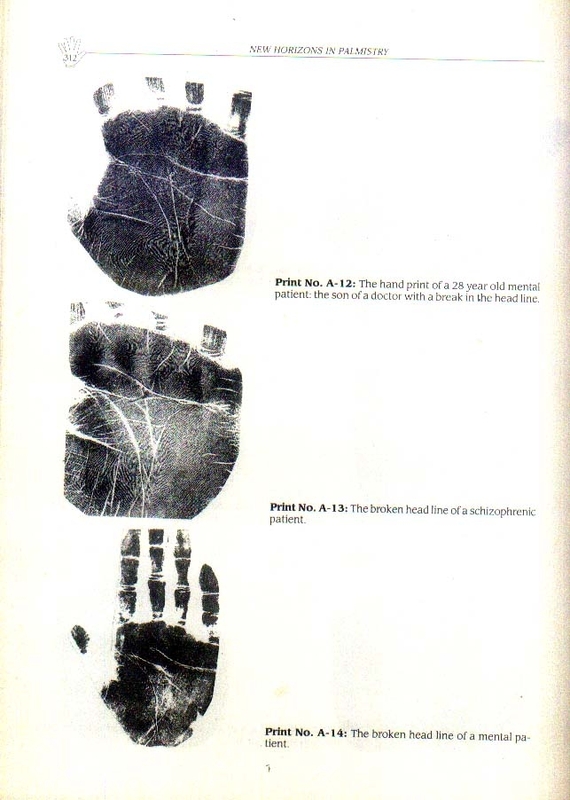 Related to this topic I have some reference hand prints of schizophrenia ,mentally retarded and mentally disorder patients. 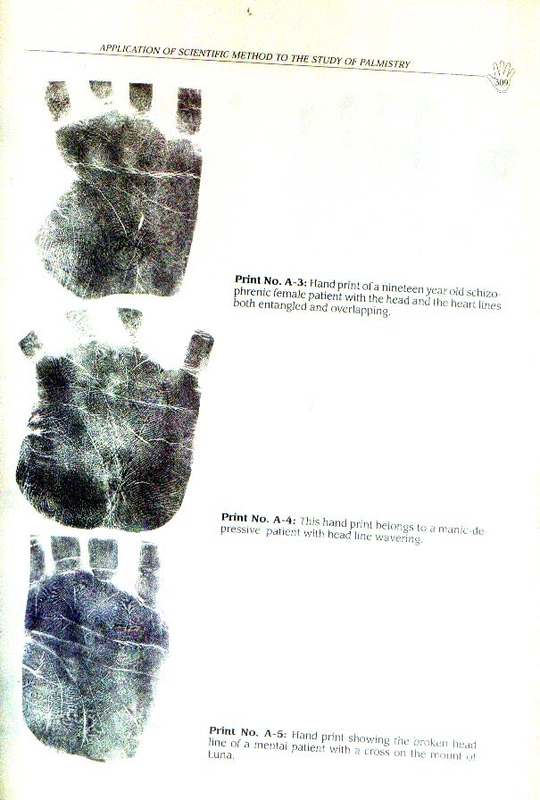 This hand print is scanned from M.A Malik's book " The new horizon in Palmistry"
These are fantastic Asif! Thank you for your efforts. I must have missed this post. I would love to get a copy of Malik's book. Any suggestions as to where I can find it? cshahar wrote: These are fantastic Asif! Thank you for your efforts. I must have missed this post. I would love to get a copy of Malik's book. Any suggestions as to where I can find it? Regarding this book sent you a PM (private message ). I would love to hear your thoughts about mr. Malik's presentation!? For, obviously - despite the fact that Malik described in his book that not all mentally retarded/mentally disordered patients had some abnormalities in their headline (only 20%... ???) - ALL COMMENTS featured with Malik's picture suggest that there is a direct connection between those head line characteristics and their disorder. Sorry guys, I am sceptical about Malik's presentation... because I am aware that quite a few very intelligent people (I've got a large sample of University students in my collection) have likewise major abnormalities in their head line! "There is one rule in handreading in psychological diagnosis which overrides all others. This one rule holds that everything modifies everything else. Everything has an influence on everything else, and everything is influenced by evertything else." I am not 100% sure, but... I have the impression that mister Malik doesn't seem to be aware of this basic rule in chirology / modern hand reading. Again, Charles + Asif... I would love to hear your thoughts! PS. I think it is also worisome that Malik also present a 'mix' of example of mentally retarded patients... and people who suffer on psychopathology (such as schizophrenia); for I think it is obvious that one should associate nor 'mix' both groups of patients - simply because they suffer on a completely different pathology. I would have expected a more 'skilled' approach from a psychologist. How does my explanation sound to you ...??? Thanks for sharing your experience and comments both . I have been long waiting for your response. At my side M.A Malik is very brilliant in palmistry and his publication was not very old it was about 1999. Anyway, He is also expert in psychology and has more than 40 years teaching experience of psychology in a university of Pakistan and Canada both. 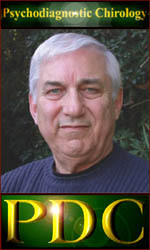 His works consists of researched based. According to him he has been working and researching on palmistry since 1940 for this purpose he traveled a lot and burn midnight oil in a library. Yes, I agree with you in some instance he is not much perfect. As far as my personal experience is concerned I observed many hands with head lines are islanded and broken but these types of people are very intelligent and some are indulging themselves in a teaching profession. Martijin, I would like to start new thread as a psycho patients hand. Some of them related to M.A Malik's books in order to you understand his theory in a better way. What's your opinion? 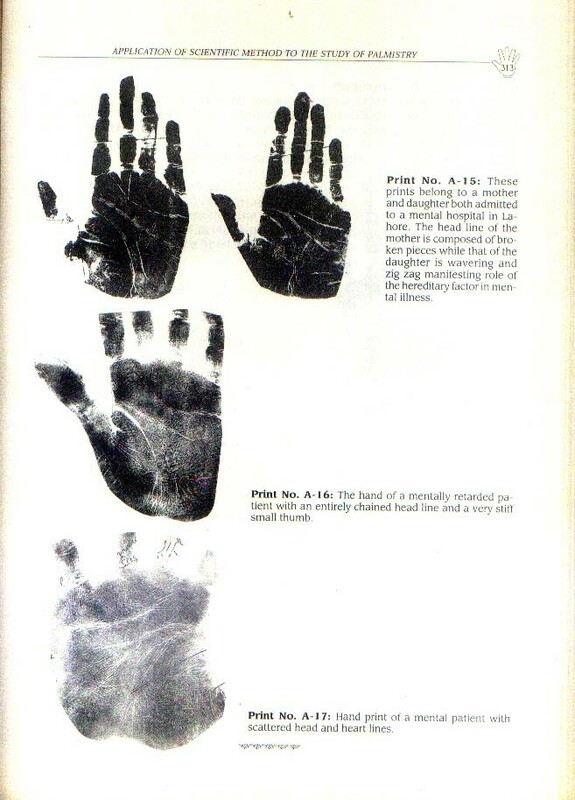 And some hand prints are really interesting for forum members.